We are really excited about the experience that we are offering over this 17-day trip to the Sacred Valley and Lake Titicaca. PLEASE NOTE THAT THIS TRIP IS NOW FULL. Please email Chris if you'd like more details of our 2020 journey, which we will be announcing after this year’s trip, and stay connected with us via our website, Facebook or our newsletter if you would like to come with us! Every journey is different. Next year, we travel through the Sacred Valley and across the sea at the top of the world, Lake Titicaca. 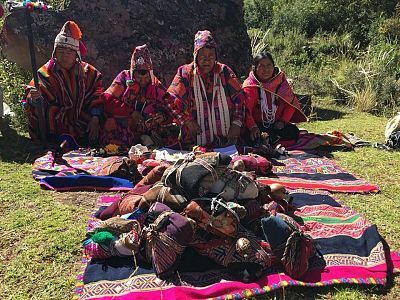 We travel with our shaman, the Q'ero... and as we make our way through the Sacred Valley of the Inca, following the course of the River Urubamba from Pisaq to Machu Picchu. And we are delighted that we will also be in the company of our friend and guide, shaman and author Jorge Luis Delgado. This is a unique and special trip of a lifetime, walking with the shaman of the Sacred Lalley and lake Titicaca, experiencing something of what it means to walk a medicine path.. our sacred journey with kindred spirits. As we travel together up the Sacred Valley, our journey will honour the elements of water, earth, fire and air... and our connection to each other and to the mountain presence that brings us home. Everywhere we go we will be creating ceremony; in caves, in waterfalls, in the landscape, at lakes... healing our relationship to the earth, and our brothers and sisters of this human family; bringing right-relationship to ourselves and all Mother Earth's creations. 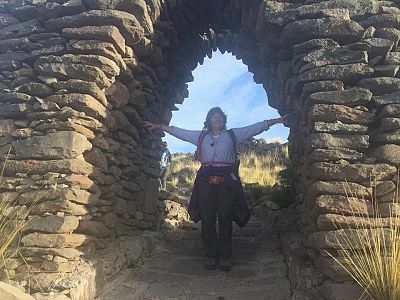 We visit with the colourful markets at Pisaq, and Cuzco, and the beautiful temple to the Great Feminine at Moray, where we can sit in the landscape of circles and truly connect with Pachamama. We will hold sacred healing ceremonies, before we step onto the crystal city that is Machu Picchu. There, we honour the light of the sun as it rises above the mountain, fingers of light spreading across this extraordinary landscape, carved from the jungle. We travel from Cuzco to Lake Titicaca through the landscape of the Altiplano, following the ley lines, and stopping at temples and sacred sites along the way. We take a boat across the Lake to the beautiful island of Amantani, where we are welcomed into the homes of these kind-hearted islanders. Staying with familites here is a great lesson in simplicity, beauty and generosity of spirit. In the evening here we do ceremony as the sun sets across the sea at the top of the world.. this is truly a magical experience. The Chulpas at Molloco is where we release that which no longer serves us; at Sillustani, we connect with the ancient ones, those who have gone before us... and the Children of the Sun, those who come after us. We will visit places in this extraordinary landscape where we can use the ancient altars to Mother Earth and Father Sun to harmonize these energies that dance within us. Together we also travel to other, more secret places,,, places where few tourists go, and where we will find waterfalls, and caves and lakes that call us to ceremony... to honour our relationship with the earth and the natural world. This journey is open to all, and will be a mix of those who are stepping into this lineage with us for the first time, and those who have already begun to walk the medicine path with us and who wish to bring their medicine to life in the land that birthed the practices and teachings that already inform their work in the world. We are looking forward to working with you to make the most of this pilgrimage, a journey of a lifetime. The total cost is comprised of a non-refundable £525 deposit and a payment of USD$2,700 (please add $480 if you’d like a single room). We will send you information on the flights that we recommend that you book - particularly the internal flights). 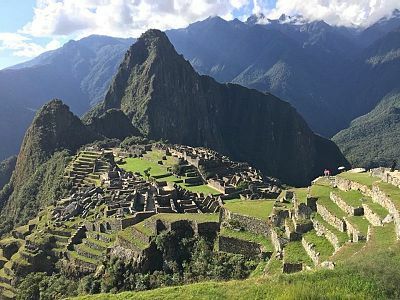 Our general guideline for spending-money is to bring at least £400 to £600, depending on your own budget; you'll want to have this mostly in Peruvian Sols. We organise the entire trip: all hotels (EXCEPT for the hotel at Lima airport on 17 May), our train tickets, every step of the journey is held waiting for you... all you need to book for yourself are your flights, both international and within Peru. Our itinerary is listed on the right, but please be aware that things can change! This is Peru, and sometimes circumstances mean that we have to be flexible. INCLUDED IN THE COST: accommodation in beautiful hotels, breakfasts, together with some lunches and evening meals. On other days we make our own individual arrangements, such as in Ollantaytambo where there are lots of restaurants to choose from. All boat and coach journeys; all visits to sacred sites. NOT INCLUDED: your flights, your hotel in Lima on Friday 17 May, insurance, some lunchtime and evening meals (around £5-£10 per meal), shopping 😁 You will need extra money for healing sessions with the shaman ($50). Some bottled water is included but you will also need to take advantage of the regular opportunities to keep your own good stock of water, soft drinks and snack; tips for our drivers and hotels. Email: Chris for more information and to book for 2019. BUS FROM CUZCO TO OLLANTAYTAMBO. FLIGHTS FROM JULIACA TO LIMA; & FROM LIMA HOME. IMPORTANT NOTE FOR 2019: YOU WILL NEED AT LEAST 6 MONTHS LEFT ON YOUR PASSPORT FROM THE DATE OF OUR RETURN. This journey is open to all, and will be a mix of those connecting with this lineage for the first time and also those who have begun or undertaken the Medicine Wheel training with Spirit of the Inca. If you would like to speak to us about joining one of our trainings or workshops in time to make this trip with us, please get in touch. If you are ready to make this journey and want to join us, get in touch! 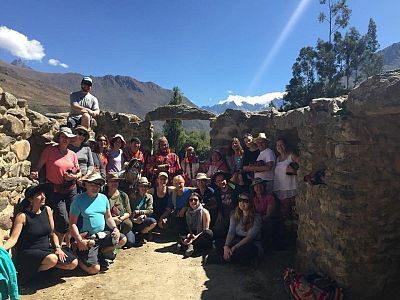 "The Peru trip has opened and changed my personal life massively since returning home. I thoroughly enjoyed the journey"